A fascinating insight into the work of the women of FANY, the First Aid Nursing Yeomanry Corps, from its creation in 1907 through both World Wars to the present day. Our speaker Sandra Webb will be including information about their extraordinary relationship with the Special Operations Executive during WW2. Speaker Steve Cliffe has promoted heritage within the Borough for decades, particularly through the Stockport Heritage magazine, which ran for 97 issues from 1987 to 2017. The fight to save Staircase House and establish its award-winning museum featured prominently in that worthy and worthwhile journey. In 1863, Stockport warehouseman William John Battersby refused to change the date of his wedding, a decision that ultimately cost him his job. He could never have guessed that this would be a pivotal moment, not just in his life, but ultimately in the history of the British hat industry. This evening Rupert Battersby will be talking us through the history of the family business. The AGM will be followed by a light-hearted talk from David Guyton, making a welcome return, about findings in the graveyard! 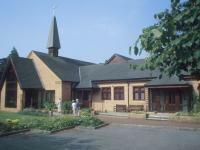 This evening the Bramhall Group will be celebrating our 20th birthday.